With 2,180 miles stretching across 14 states, a thru-hike on the Appalachian Trail is daunting for anyone to attempt. For Asheville resident Jennifer Pharr Davis it was a calling. However that calling wasn&apos;t just to hike the entire trail, but to break the record for speed set in 2005, and that&apos;s just what she did. To top it off she surpassed not only the women&apos;s record, but the men&apos;s as well. Logging in over 40-50+ miles per day, Davis completed the trail in 46 days, 11 hours and 20 minutes breaking the previous record set by Andrew Thomas by one day, two hours and 11 minutes. 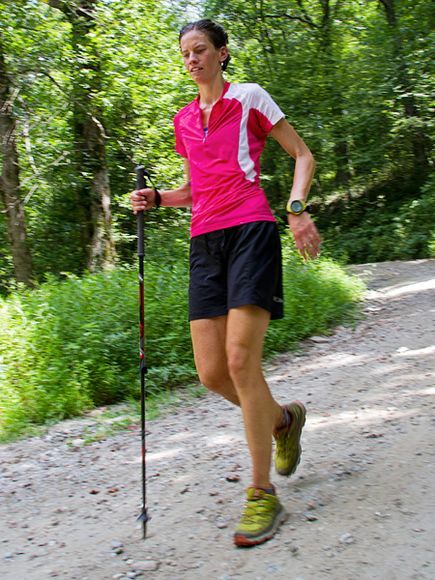 “My previous hike in 2008 taught me that setting a record wasn’t about being fast or strong. It is all about fortitude, intelligence and perseverance. The fact that women give birth and live longer than guys makes me think that we might even have an evolutionary edge,” Davis said regarding her ambition to break the overall record. Along the way Davis weathered shin splints, thunderstorms and had multiple wildlife sightings such as moose, bears and grouse. Her “pit crew” included a number of friends and her husband Brew, all of which cheered her on along the way, met her at trail crossings to provide supplies and some even hiked long stretches to provide company. Davis’ husband chronicled each day of the journey on her blog so that people could follow the adventure. Davis is also the author of Becoming Odyssa: Adventures on the Appalachian Trail that details her previous journey down the AT. The Appalachian Trail travels along 300 miles of beautiful North Carolina mountains. Well known by the locals as offering some of the most dramatic views, here are some top hikes to get you back in touch with mother nature. Roan Mountain: Known for it&apos;s expansive grassy balds and flowering rhododendrons this area of the AT offers gorgeous panoramic views. Visit the Roan Mountain recreation area to find restrooms, picnic tables and a paved half-mile trail. Or park at Carver&apos;s Gap for a longer seven-mile hike. Clingman’s Dome: At 6,643 feet, this is the highest point along the AT. From here you can hike on a number of different trails that provide stunning mountain vistas. Max Patch: Located near Hot Springs, Max Patch offers 360 degree views atop 350 acres of open grassy field. The AT passes right through the middle and is a popular place especially during leaf season. Here are some other suggested mountain hikes around Asheville.